This is Laphroaig's latest 'travel retail exclusive' and is first matured in first-fill bourbon casks, before further maturation in European oak casks. It's un-chill-filtered. 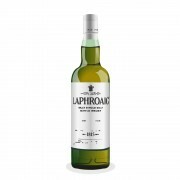 On the nose, there's the usual Laphroaig seaweed and peat smoke, with frankincense, black pepper, a sweet brininess and vanilla. In the mouth, it's full-bodied, with a big hit of spicy peat smoke, followed by waves of liquorice, cola, pepper and raisins. The finish is big and smokey, very peppery, and then vanilla pokes through to soften the smoke a little. Laphroaig An Cuan Mor Just stunning! I wonder, how does this compare with the quarter cask? I find that one is a bit too oaky for my liking. I love the cask strength and the 18 however. I think the oak in this is well balanced, with creamy vanilla notes without being woody. Then again, I love the QC, as well as the cask strength and the 18, so I might be a bit biased towards oak in my whisky!